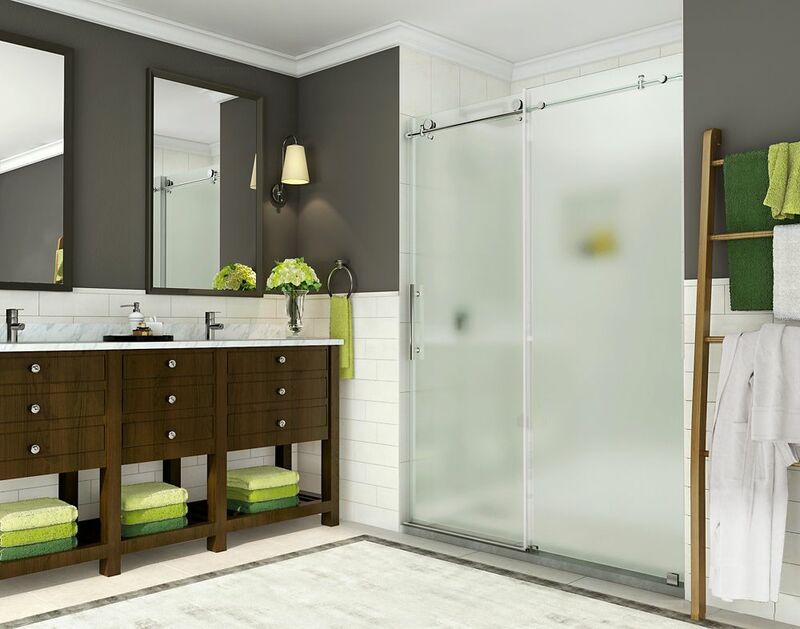 Coraline 56 inch to 60 inch x 76 inch Frameless Sliding Shower Door with Frosted Glass in Chrome With its clean lines and striking hardware, the Coraline Completely Frameless Sliding Shower Door creates the ultimate modern showering experience. This door is beautifully designed with premium frosted 3/8 inch tempered safety glass; tested and certified to ANSI Z97.1 Standard and an innovative two-wheeled sliding operation. The Coraline sliding door is available in a number of standard sizes and the top rail can be cut down up to 4 inches for an accurate fit. It is designed for either a left or right-hand installation and is available in multiple finishes. The Coraline door will create an open, minimalist feel in your bathroom and become a focal point. This model does not include the shower base. Images are for representation only. Glass may differ slightly than shown in image due to the nature of light absorption and reflection from your own bathroom's colour, design or decor palette. This is normal and should be expected in certain scenarios due to the glass's natural composition. Coraline 56 inch to 60 inch x 76 inch Frameless Sliding Shower Door with Frosted Glass in Chrome is rated 4.7 out of 5 by 31. Rated 3 out of 5 by Anonymous from very simple for installation does take two people glass is heavy picture shows white frosted glas... very simple for installation does take two people glass is heavy picture shows white frosted glass but it is more of a bluish tone which makes it stand out more if I had known probably would not have got the frosted glass and got the clear. Rated 1 out of 5 by manich from Unless you are looking for a definite opaque aqua green frosted glass, do not order this door. I ... Unless you are looking for a definite opaque aqua green frosted glass, do not order this door. I was at work when my husband and son started installing it, or else I would have told them to STOP. My bathroom tiles are neutral creams and tans, with black accents, and this door just clashes. I am so disappointed because we paid a lot for these doors and now we are stuck with them. The picture shows a slight translucency; there is none. So now I have to keep the door open to enjoy the beauty of the shower tiles. I am really sick about this. I would add an image but there was no option on my phone to do so on a review. Rated 3 out of 5 by Michael from The color of the glass is green. It is... The color of the glass is green. It is not a clear frosted as it is in the picture.